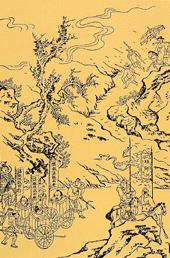 Water Margin (水浒传 Shui Hu Zhuan) is a novel that is said to have been written by Shi Nai'an. It is one of the Four Great Classical Novels of Chinese literature. The story is set during the Song Dynasty. It is about a group of outlaws who gather to form an army, and are later sent to fight foreign invaders and suppress rebel forces by the government. The book was written during the 14th century. This page was last changed on 13 August 2018, at 18:43.